The Railway Recruitment Board is conducting the Assistant Loco Pilot and Technician Examination from January 21, 2019 to January 23, 2019. Today is the second day of the exam and slot 1 is already completed. So, we are providing you the detailed exam analysis of day 2 exam- slot 1. Candidates who are attending the further slots can go through these questions before going to examination. Most of the questions would be repeated from previous examination. So, candidates are suggested to go through the analysis once. 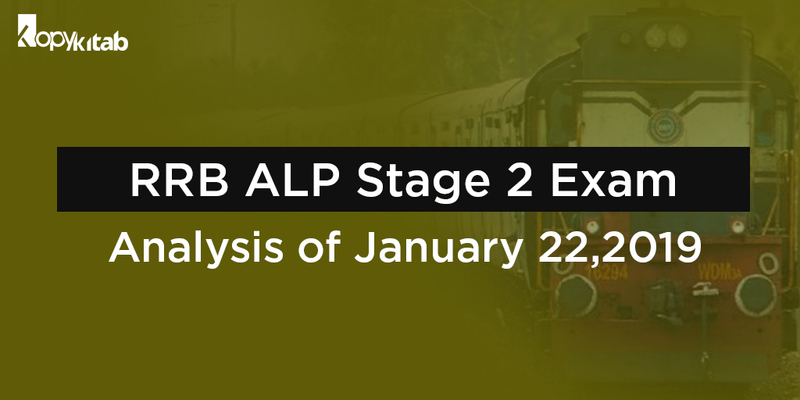 Go through the detailed exam analysis of January 22, 2019 exam. The last slot of the day is also completed successfully. The overall difficulty level of slot 3 exam was moderate. Most of the questions were repeated from previously asked questions. Here is the complete analysis of Slot 3 exam. One question was related to lens. 1-2 question were related to numerical section of science. What is the SI unit of Luminous Flux ? 1 question were asked from the speed and Velocity. One question was related to Resistance. If a+b = 7 , ab = 12 , find the value of a2 +b2 =25. If A works 25 % of whole work in 3 days, and B complete the 1/2 work in 18 days. The number of days taken by A & be to complete the whole work ? Find the value from 10 of 1000% of 10% ? An electronic device spends energy of 1000 Jule in 1 seconds . if this device is working for 1 hour. then find the spent current ? One question was related to Electric Motor. Why do we use water in Radiator ?-Because it has a high Specific Heat. The slot 2 is completed well. The question paper is easy to moderate difficulty level. We have compiled the important questions from the slot 2 question paper. Candidates are suggested to go through the exam analysis for their preparation. Here is the analysis of slot 2 exam. The 1st slot of the 2nd day exam is completed. The examination difficulty level is easy to moderate level. Candidates attending the upcoming exam today and tomorrow can refer these analysis and question which would help their preparation. We have compiled most of the important questions appeared in the examination from each section. Here is the analysis of Slot 1 exam. One question on ohm’s law. What is the SI unit of Kinetic Energy? Conversion of L to m^3. Find the value of mechanical advantage, if Velocity & efficiency was given. One question on the formula of Kinetic Energy. What is the SI unit of EMF? Which fire comes in the category of B class? What is the SI unit of Specific Heat? One question from Drawing sheet ratio. One question of ratio of drawing sheet ratio. The Relevant Trade was bit tough compared to yesterday’s question paper. So candidates concentrate more on this section. Candidates attending the further slots examinations are suggested to go through these above listed questions for reference. Most of the questions will be repeated. Hence, candidates can requested to prepare well.